One of the most popular MDM solution is Oracle Hyperion Data Relationship Management. Oracle DRM is used to resolve the challenges across the people, processes, and tools that go into the tasks of data management. 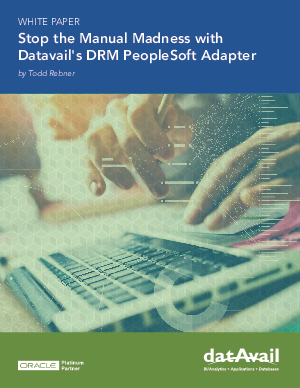 Although Oracle DRM is a powerful software, it nevertheless presents challenges for organizations seeking to integrate it with other Oracle applications such as PeopleSoft Financials – DRM is unable to automatically push updates made within its system to PeopleSoft. As a result, changes in DRM to cost centers, project centers, trees, and hierarchies must be manually updated in PeopleSoft Financials – a tedious process that can take hours every day. The good news is that these challenges can be easily addressed with the support of partners such as Datavail.